Many of you have asked where I’ve been the past month. Whew…I have been traveling a ton for my business. I have been speaking, leadership training and have added many new clients in the past two months. It’s been a lot and so much fun! Over the past few months, two words come to mind: Stamina and Resiliency. Stamina and resiliency are two words that are very relevant with my clients, leadership teams and my audience’s lives today. What does your resiliency fitness look like when the heat is on? This month I will start another challenge and I know you are all shocked! Staying relevant our field is critical as the landscape and challenges change daily. There is a New National Health and Wellness Coach Credential from the National Board of Medical Examiners, the licensing Board for Physicians. I will be adding this credential to my expertise as many of my high level clients, organizations and teams are asking for support in this area. As well as supporting their professional growth as executives and leaders, a focus on personal health and wellbeing is a big part of their success. Resilience capabilities are an area of development for executives and leaders. Learning how to develop stamina and resilience is part of an individual’s game plan to optimize their well-being and success. Everyone wants to be “more fit”. One key area that will determine each individuals growth and get to the next level is resilience. In resilience development, people are on two different ends of the spectrum and this determines which tools to use in preparing and coaching them for high expectations, pressures and the fires they face daily. Many executives and leaders, who are climbing the ladder, do not have the necessary resilience traits developed. Some of my clients are already demonstrating characteristics, and this is a sign they are generally resilient. 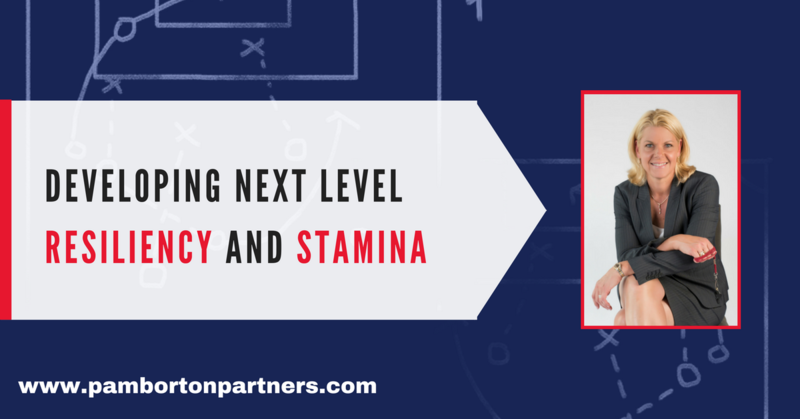 Tools that prepare them for the next level are a high level of stamina and resilience. Developing this mindset is critical. Athletic coaches develop mental toughness daily, resilience and stamina in elite athletes and high performing teams is a necessity in order to perform and win at the next level. This is a unique skill set in coaches. If you sleep well, good physical wellness, and mild mood fluctuations, then you may have a pretty good level of resilience tools and control. If an executive is feeling overwhelmed, irritable, sarcastic, and decreased social engagement they are likely stressed and on the end of the spectrum of needing resiliency tools and support. Many executives, teams and organizations are focused on their own and employee’s wellbeing. High expectations and change is happening in every industry at every level. A focus on increasing resilience skills is a mindset and can be developed. How would you rate your resilience and stamina on a daily basis? I can’t wait to get started! Previous: Previous post: Do you need Inspiration or a Pep Talk?